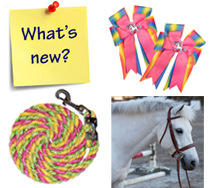 Check out the latest products at Just for Ponies! We love searching for and finding all the cool stuff you need for your kids and ponies. Whether it's the latest style blanket, a new pony bit or the most current color and fabric choices for your riding attire, we've got it. We're always searching for new pony and kid products so we can give you the best selection possible, right at your fingertips.